1. Preheat the oven to 220°C, gas mark 7. In a small bowl squeeze the black garlic cloves out of their papery skins,and crush to a paste using the back of a teaspoon and pressing against the bowl. Whisk in the oil, lemon zest and juice to make a paste, then season with a pinch of sea salt and freshly ground black pepper. 2. Take a rectangle of non-stick baking parchment twice the size of the fish and place on a baking tray. Place one of the sea bass fillets (skin side down) at one end, spoon on one third of the black garlic paste, then scatter with the sliced salad onions and half the chilli. Place the remaining fillet on top (skin side up) and spoon on one third of the black garlic paste. Fold the baking parchment over and the edges under to seal and form a parcel. Bake in the oven for 12–15 minutes, or until the fish is opaque and just cooked through. 3. 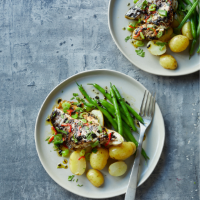 Serve halved, topped with the remaining black garlic paste, scattered with parsley, remaining chilli and a wedge of lemon, accompanied with new potatoes and fine green beans.